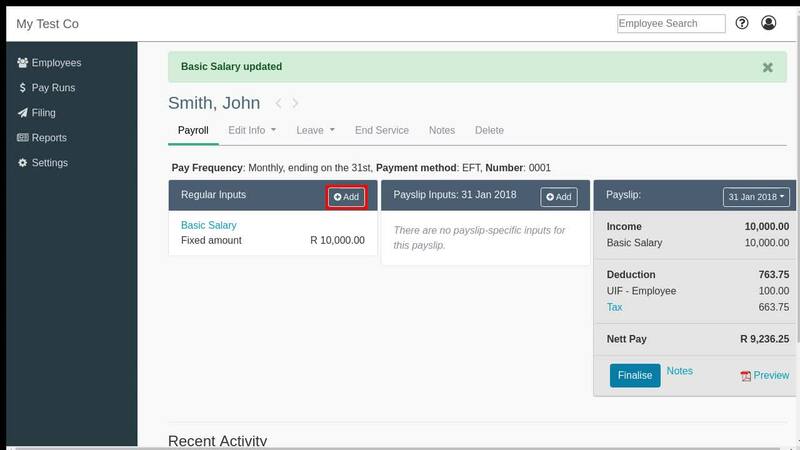 If you click on an employee’s name when you are in the Employees section (on the left-hand menu), you will see the screen where you generate their payslips. Once you have finalised all of your payslips, you will need to create a pay run. Pay runs are a means of grouping payslips; they are purely for convenience and do not affect any payslip data in any way. Creating a pay run allows you to print payslips in bulk, post to Xero (if you have set up the integration), download EFT files and send payslips to Self-Service (discussed below). Creating a pay run is simple – click on Pay Runs and then Create Pay Run for the relevant period. That’s it! Based on your finalised payslips, SimplePay automatically generates the documents necessary to do your monthly EMP201 and UIF submissions. In fact, you have the option to submit your UIF declaration directly to the Department of Labour through SimplePay’s built-in functionality – no need to download and upload forms. When an employee leaves the company, or if you want to remove them for any other reason, you will need to end their service. This has to be done individually for each employee as a UIF code is required. SimplePay generates EFT files that can be uploaded into any of the major banks’ online banking platforms, which enables you to pay all of your employees in one go with ease. However, you will first need to complete your company’s bank details. Please note that these settings are purely for the purpose of generating EFT files to pay your employees and have no bearing whatsoever on how you pay your SimplePay invoices.